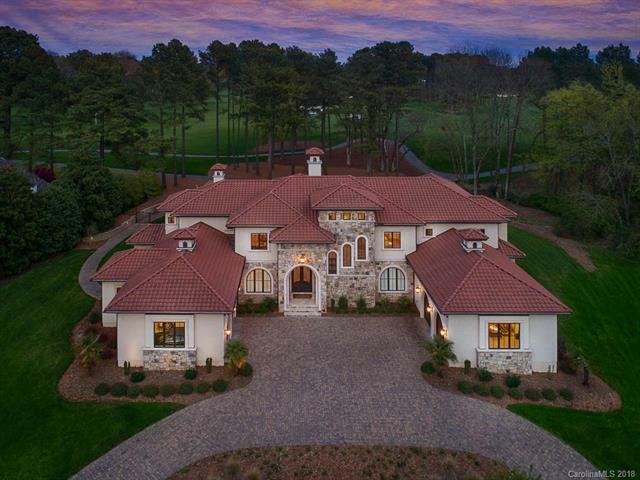 Remarkable home beautifully situated on the 4th fairway of Quail Hollow Club in the gated neighborhood of Seven Eagles. Gorgeous Mediterranean home built by Arcadia in 2012 offers 5 BR, 5 full baths, 3 half baths, & a spectacular wine room off of the foyer. KT offers 2 large islands. Stunning views of the golf course from the outside veranda. Electric screens turn the veranda into an automatic screened porch. There is an outdoor kitchen area, heated pool, hot tub and fire pit. The 5th bedroom/memorabilia room has its own private terrace. Master down with a morning kitchen, enormous custom closet & separate exercise room. Master bath has a steam shower and private outdoor lounging area. The well provides water for the pool and irrigation. Four car garage. State of the art audio/visual. Tile roof & incredible flat lot. Separate golf cart garage w/ pavers leading to the golf course. This Mediterranean home is a work of art & has a wonderful floor plan for entertaining indoors & out.